Products | Square Pharmaceuticals Ltd.
0.6 mg (1 tablet) once or twice daily in adults and adolescents older than 16 years of age. Maximum dose 1.2 mg/day (2 tablets). •	1.2 mg (2 tablets) at first sign of a gout flare followed by 0.6 mg (1 Tablet) one hour later. •	The maximum recommended dose for treatment of acute gout attack is 1.8 mg over a 1 hour period. •	The maintenance dose will be as same as the prophylactic dose, which should be resumed after 12 hours of the acute treatment course. 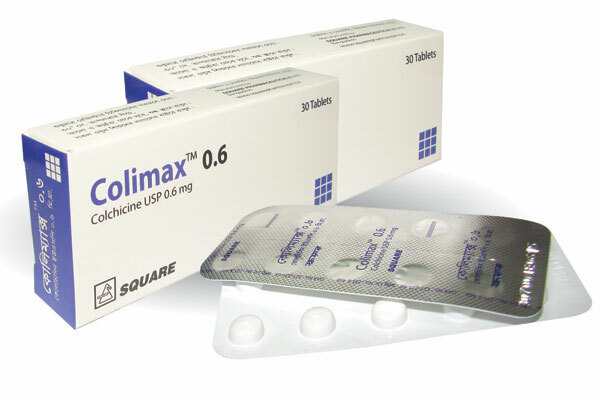 ColimaxTM Tablet: Each box contains 30 tablets in Alu-PVDC blister pack. ©2019 Square Pharmaceuticals Ltd. All Rights Reserved.